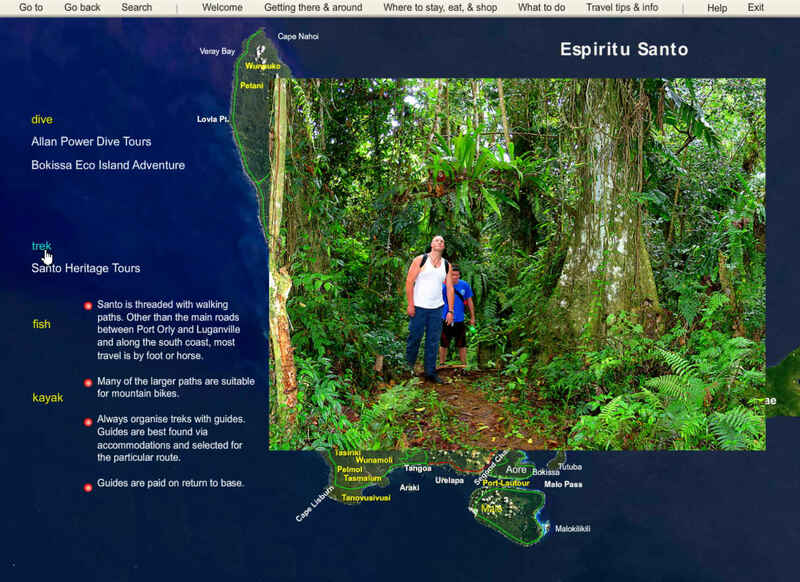 Rocket travel guide to Vanuatu - what's on the Vanuatu tourism information holiday guide? for Professional Travel Agents -- and now for you. 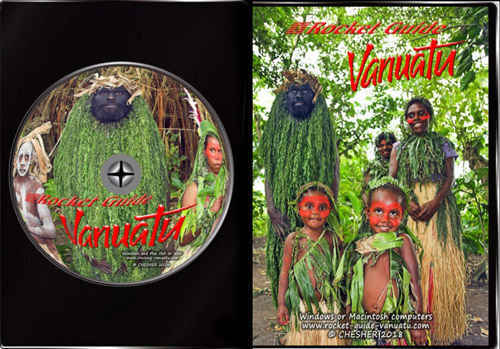 What's on the Rocket Guide to Vanuatu? The Rocket Guide to Vanuatu is the fastest, most complete, travel planner to Vanuatu ever created. 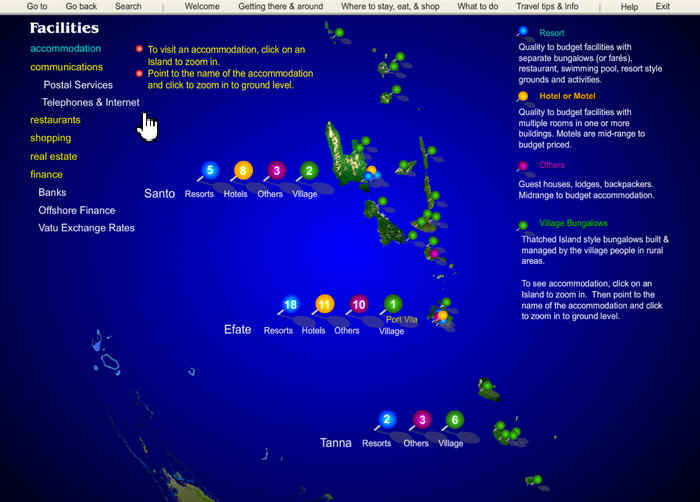 Like the Rocket Guide to New Caledonia, The Rocket Guide to Vanuatu is an interactive program with a very user friendly interface based on satellite and aerial images. It was commissioned by Vanuatu Tourism as a training program for travel agents. 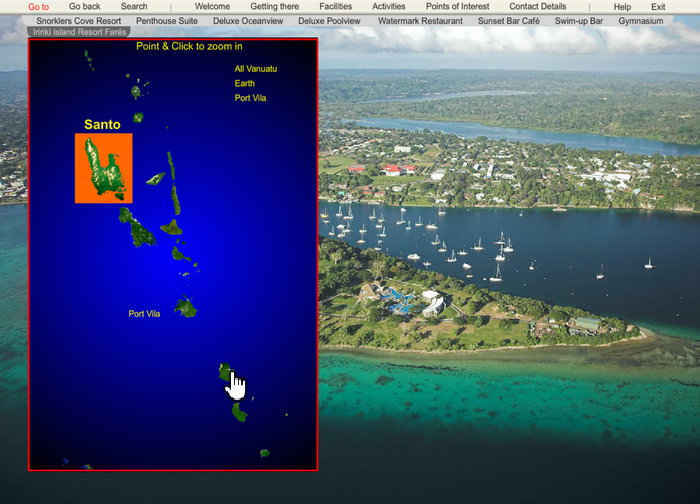 The guide combines high resolution satellite and aerial images with full screen images of Vanuatu hotels, resorts in Vanuatu, Vanuatu diving, wildlife and river trekking, Vanuatu golf courses, and Vanuatu maps. But not on phones, ipad or Android tablets. Covers all of Vanuatu and it's islands. Designed as a training program for travel agents. "We find the Rocket Guide to be a great learning tool for our students. They are so useful within our classrooms. " Where to stay, eat, shop, play and party. Communications (phone, internet, postal services). Unlike web sites, the Rocket Guide gives big full screen razor sharp images instantly. Unlike the Internet where you need to search and search for each part of your vacation plan you'll have everything right there, instantly available, completely organized for rapid access in a standard and easy to understand navigation system. You can go anywhere in Vanuatu in two clicks. No more hunting through the myriad websites from travel wholesalers and travel agents and hotels - where you can never know if they are giving you accurate information or if they are just "selling" the destination. The Rocket Guide leaves out the "advertising" and throw-away comments like "the best" and "unsurpassed" and "magnificent" so you can make up your own mind based on non-hyped imagery and clear, factual information. 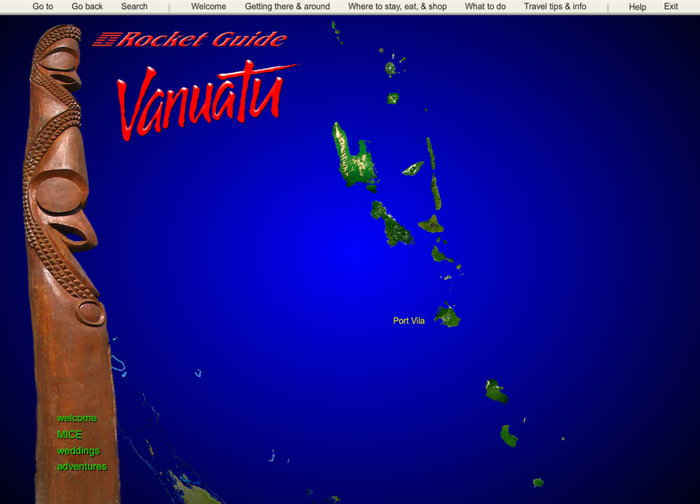 The Rocket Guide opens with a full screen satellite image of Vanuatu and a menu that offers links to general information about Vanuatu. There are special sections on adventure travel in the out islands of Vanuatu, conferences and weddings. 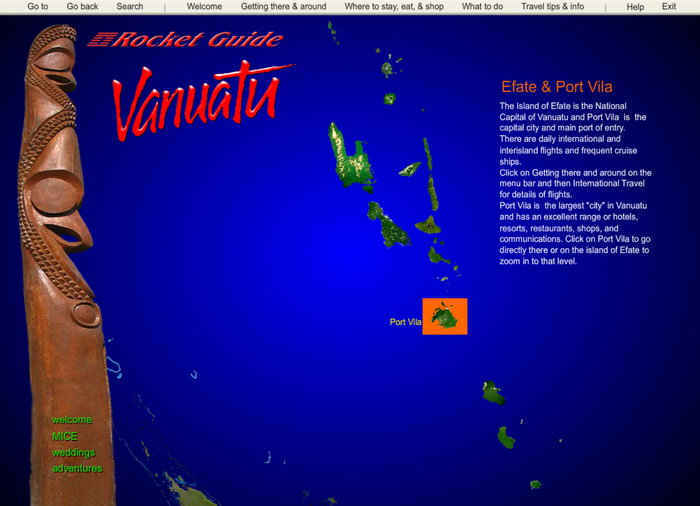 The Rocket Guide uses a point and click navigation system to explore Vanuatu from outer space to under the sea. Point to any part of the island and a brief travel summary instantly pops up with information about that area. Here we have pointed to the island of Efate in Vanuatu. Let's say you wanted to find out about hotels in Vanuatu. 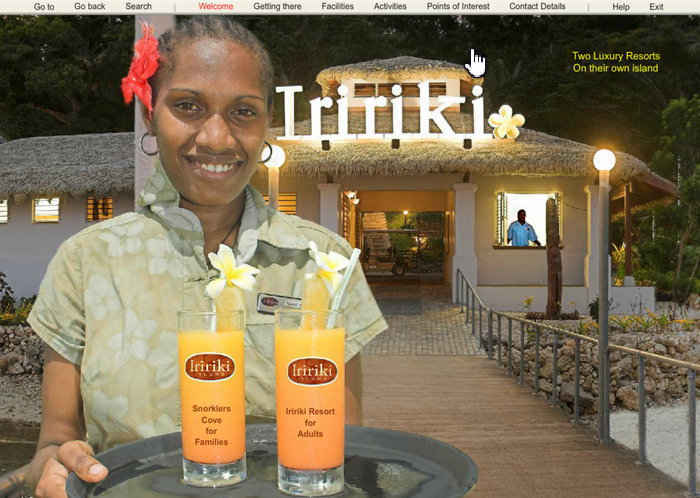 Click on the menu item "Where to Stay, Eat, Shop and Party" and then on the sub-menu item "Accommodation" to see this summary of hotels, resorts and village bungalows everywhere in Vanuatu. If you want to stay in Port Vila, click on the name Port Vila. 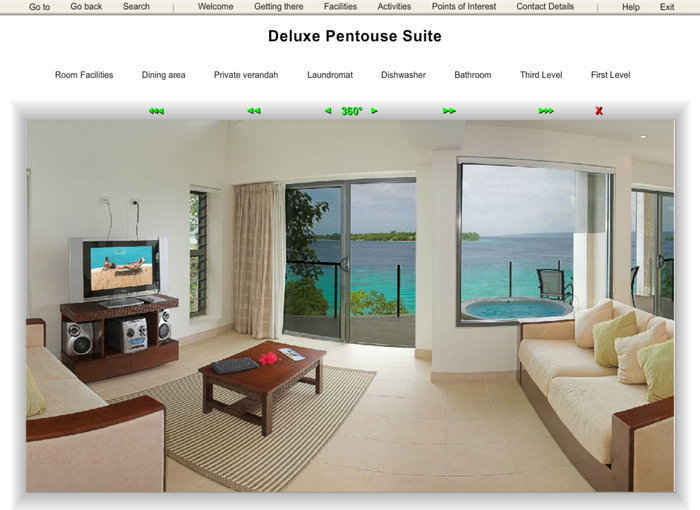 Instantly you will be looking at Port Vila with a list of hotels and resorts. Point to the name of a hotel to see an image of the accommodation, a summary of facilities, contact details and a pin flashing on the satellite image showing exactly where the hotel is located. Click and you are at the hotel. Click on the hotel's name for a presentation about getting there, facilities, activities, points of interest and contact details. You'll see what kinds of rooms are available, and a brief summary of each kind of room. There are also links to other facilities, like the restaurant and swimming pool. Click on a Room to visit it. Click on a room or suite and instantly see a 360 degree image inside the room along with a summary of room facilities (square meters of floor space, kitchen, TV, WiFi, Terrace, bathroom details - along with a photo of the bathroom.) It's like standing in the middle of the room. The room images are "What you see is what you get" not "set up" for advertising shots. 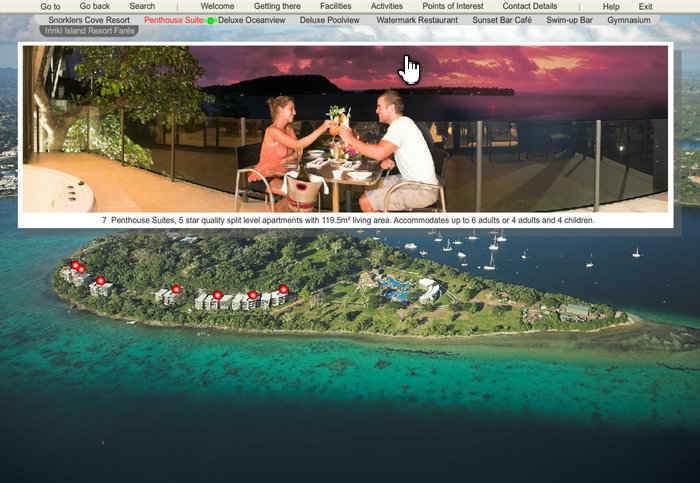 You can go anywhere in Vanuatu in one click on the Go To menu. 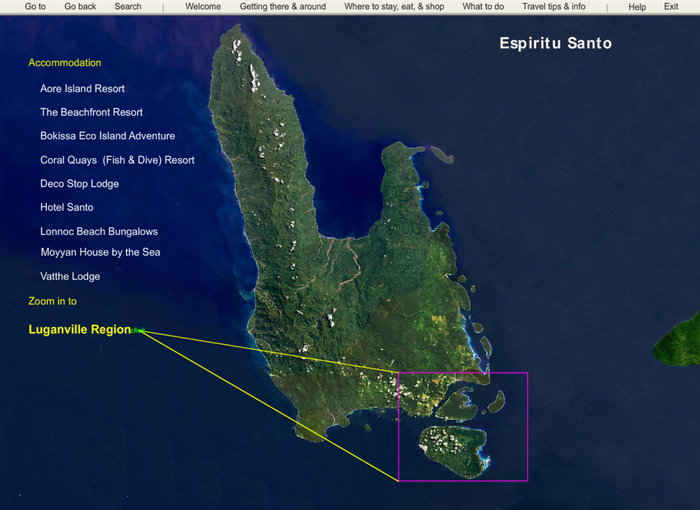 Here we've selected the island of Espiritu Santo. Click on it to go there. For every island you'll find information on getting there and around, where to stay, eat, shop, play and party, what to do, travel tips and info and information on communications. Vanuatu's tourism activities are right there so you can choose what you'll do before you arrive and have plenty of time to enjoy your favorite activities. It's like you've been there before and already have local knowledge about getting around, where to stay, where to dine, and what to do. Become an expert on travel in Vanuatu and have a happy, satisfying journey.